REVIEW: Slap, clap, tap, stamp and Stomp! A fast-moving scene from Stomp. If you thought that brooms were for brushing, sinks for washing in and newspapers for reading, then think again – they make just as fine musical instruments. Check out Stomp at the Theatre Royal, Newcastle, this week and you’ll see what I mean. Stomp is the ideal show for all those of us who fancy themselves as drummers, those who can’t resist tapping out an annoying rhythm with their knife and fork at the dinner table, or flicking the steering wheel in time to the music on the in-car radio. It is a performance that fuses exhilarating dance, particularly high-energy tap, with street theatre and inventive percussion to great effect. The irresistible slapstick comedy running throughout is gripping to the very end and means it is never repetitive or mundane. There is a beautiful mix of rumbustious, dynamic numbers and gentle, more subtle pastiches – the simple but ingenious dancing cigarette lighters will live long in the memory. There were overtones of the Kiwis’ tribal Haka, performed at the start of international rugby matches to intimidate the opposition, and gladiatorial combat with dustbin lids as shields. All manner of everyday items are used as instruments in Stomp. It must have taken hours of practice to perfect some of the don’t-try-this-at-home routines, particularly those involving flailing sticks and flying buckets, where the potential for broken fingers must be extremely high. The intricate sounds built to a real crescendo in a finale of drums, kegs and, of course, all-action stomping. There are moments of pure theatre – the performers abseiling down a wall of potential music-makers, wheel hubs, metal signs, bells and lids. Dance plays a big part in the show. 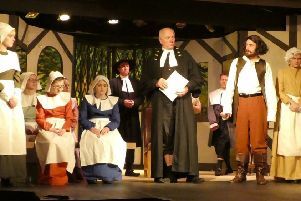 It was then that the audience was given its chance to shine with some clapping, slapping and stamping of its own – not a bad effort even if I say so myself! I had a ball – I’m still jumping now.